Erieta Attali, PhD is a Landscape & Architectural photographer with photographic work expanding from Eurasia to Australia and the Americas. After studying Photography at Goldsmiths, University of London under the supervision of Ian Jeffrey, she continued as research fellow at the School of Architecture, Planning & Preservation, Columbia University in NYC with the support of Fulbright Foundation and Waseda University in Tokyo with the support of Japan Foundation. She completed her PhD at the School of Architecture and Design, RMIT University in Melbourne. From 1992 to 2002 Attali extensively photographed excavation sites and archeological findings throughout Greece, Turkey, Italy, France and the UK, specializing in the documentation of ancient painting. Since 2003 Attali has been an Adjunct Professor of Architectural Photography at the School of Architecture, Planning & Preservation in New York and she has lectured in several universities around the world. Attali is recipient of several prestigious awards and fellowships by the Fulbright Foundation, The Japan Foundation, Graham Foundation in Chicago, Dreyer’s Foundation in Denmark, Danish Arts Council, Norwegian Embassy in Copenhagen, Chilean Ministry of Culture in Santiago de Chile and the Marie Curie Research Fellowship. Her work has toured globally, featured by major publishing houses and design periodicals. 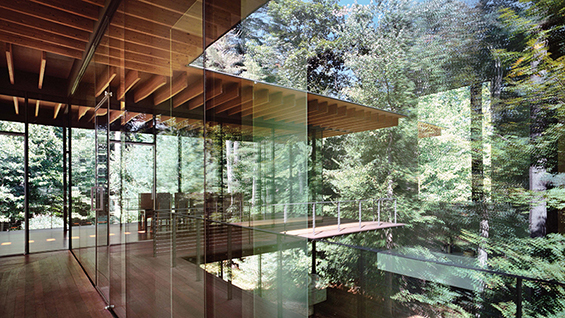 Attali together with Kengo Kuma have published the photography monograph titled Glass | Wood, Erieta Attali on Kengo Kuma by Hatje Cantz Verlag, Berlin, 2015. The Exhibition is on view in the 3rd Floor Hallway Gallery of The Foundation Building. Open to current students, faculty, and staff.